Measuring web traffic is far from an exact science, and that's a big problem for online advertisers, writes Fortune's Jessi Hempel. (Fortune Magazine) -- How many people visited Yahoo in June? About 133 million in the U.S., says ComScore, a web measurement company. No, says its chief rival, Nielsen//NetRatings, it was 108 million. The difference - 25 million people - is hardly a rounding error. It's larger than the population of Texas. And that's the problem. The Internet bills itself as the most accountable ad medium in history. But it's not as precise as it seems, and companies want proof that the $20 billion they will spend this year to advertise online is worth it. 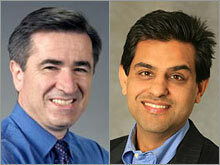 Magid Abraham (left), CEO of ComScore, and Manish Bhatia, of Nielsen Online, defend the way they track web visitors. Moreover, many are shifting from simple search strategies to online branding - things like interactive banner ads, contests, and social-networking profiles. So they need to know where customers are hanging out. Right now, there is no way to tell. "It's a really rough science," says Randall Rothenberg, CEO of the Interactive Advertising Bureau, which recently called for a public audit and accreditation process. Counting page views and unique visitors is confusing enough. Most web users toggle between several windows and soon much of that activity will be moving to cellphones. The increasing dynamism of the web multiplies the degree of difficulty. "People once assumed that consuming 10 pages was better than five," says ComScore CEO Magid Abraham. "But not all pages are created equal." New technologies like Ajax, Real Simple Syndication (RSS), and widgets make some pages more valuable than others because they let people watch videos, read news articles, or make purchases on multiple websites. The established players, ComScore and Nielsen//NetRatings, which together hold the majority of the market, know they have a problem. They support the idea of a public audit. But they stand by their current method, in which global panels of thousands of volunteers agree to download tracking software. Even so, newly public ComScore (Charts) has announced a half-dozen features to better track web behavior. Among the improvements: measuring widgets, counting video downloads, and expanding their search categories to include sites like Amazon (Charts, Fortune 500) and eBay (Charts, Fortune 500). Nielsen//NetRatings is also raising its game. The company, which counts Time Inc. (Fortune's publisher) among its clients, recently began measuring how much time consumers spend on sites. It also bought Telephia, which tracks web behavior on cellphones. It's not enough, say the critics. A number of web entrepreneurs believe the two companies shortchange them. Consider Digg.com, a site that lets users submit and rank news stories. Its own server logs recorded 10.8 million unique U.S. visitors in July. ComScore reported 4.6 million, and Nielsen//NetRatings 4.7 million. "It's a mess right now," says Mike Maser, Digg.com's vice president of marketing. "The problem is, there are no standards." That confusion looks like opportunity to companies such as HitWise, Alexa, and Compete. They eschew panels in favor of tagging web pages with small pieces of code, called cookies. When users visit a site, the server logs them in. But as many as three in 10 web users regularly delete their cookies. The big companies say that's a problem their competitors must account for. "The discrepancies, once they are whittled down," says Manish Bhatia of Nielsen Online, "are within 5 percent of each other." So what's an ad buyer to do? Ian Schafer, CEO of New York City-based interactive-ad agency Deep Focus, pulls data from as many sources as possible. "As much as you want it to be quantitative," he says, "there's a little bit of a compromise." For now.